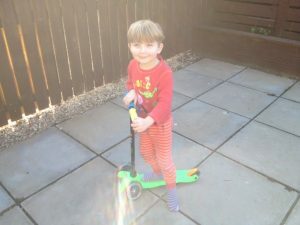 My youngest was delighted when this little parcel came through, he loves to Scooter and is a right little dare devil. 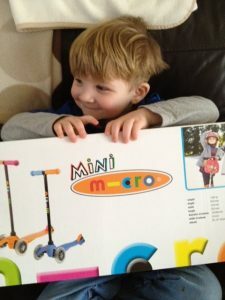 He is fantastic at it and loved the Mini Micro Scooter from the minute it arrived. We were sent through a limited edition Neon Green Mini Micro Scooter. It looks great doesn’t it. It arrives like this and is really simple to setup. Five minutes with the instructions and I was done. No help from hubby. It’s sturdy and well made. The Micro Scooters are different from the other scooters I have seen, most handles turn to go right or left, with these you have to learn slightly to either side to turn. 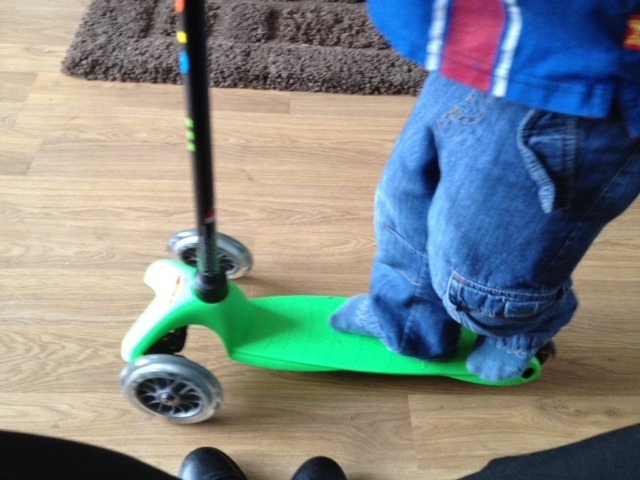 Far safer I feel, as when going fast and turning the handles you could easily loose balance. Another great thing about these scooters is they have a break. The break is situated at the back of the board, where the user puts their foot on it to slow the wheel. It’s not severe so it throws them forward. The board itself is made from non slip rubber which is great for us since Tyler wants to Scooter about the house without shoes on. The handles are also non slip rubber. It is soft but not too soft. The wheels are had plastic and can be replaced if wear and tear occurs. 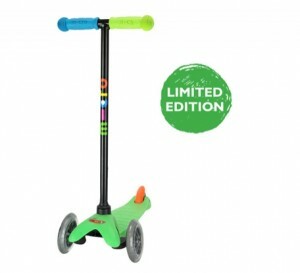 I think one of the best things about the whole Micro Scooter range is the bright colours, they look amazing and continue to look amazing after many many uses. Plus there are so many accessories you can buy to add to the scooter. The mini micro can be used when the your child is 1 year old as a seat can be bought for it. Which I think is fab and wish I’d known about these when Tyler was younger. They use it as a little trike, then as they grow it can be removed. Tyler loves to whizz up and down the living room floor. He’s always on this scooter and is definitely one of his most prised processions. He loves and so do I. 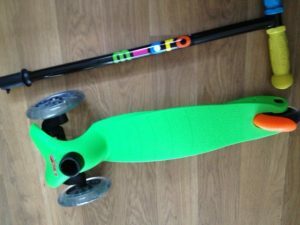 By far the best scooter I have come across and it looks great. Tyler demonstrating how easy it is to stop using the break. Having fun on the Scooter out in the back garden. 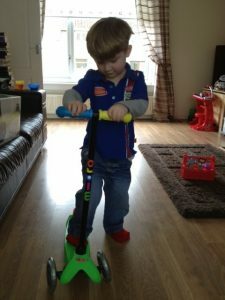 To celebrate the Queen’s Jubilee there is a lovely range of Union Jack Micro Scooters and accessories you can see here. I will leave you with a small video of Tyler telling me what he thinks of the Micro Scooter.